You’ve probably figured, based on my recent posts, that I have found a new hobby – making fun of signs at work. Yes, it’s a very strange and specific type of hobby. No, I’m not going to stop! Yes, I have some serious issues. Are we done with this untimely interrogation? Can I move on? Great! If the sign says so, it must be true! I tried really hard to believe the words, but my eyes refused to make the door vanish. What a weird sign! 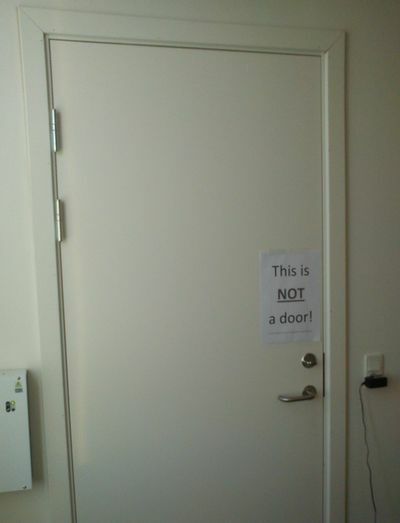 Couldn’t they just write “Don’t use this door”? Or was this a naive attempt at employee mind control? Turns out I’m not the only joker at work. Well played, anonymous rival, well played! Love it – very funny and I agree, well played! hahahaha I love that sign! Would love to see your face expression when you got closer enough to see the smaller text. I really enjoy your sign posts. They always give me a great laugh for the day! @crubin Well I guess I’ll just have to keep them coming then ;)…have a great week!